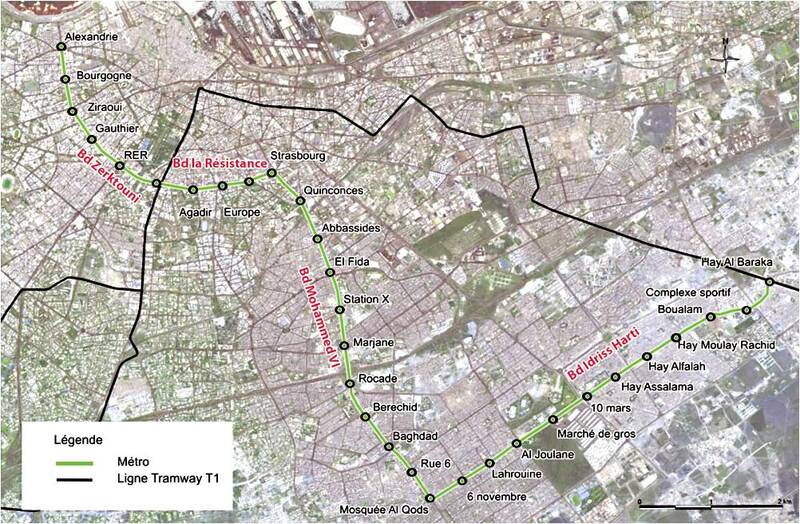 The 9.3 miles railway in Casablanca’s proposed new sky train will link neighborhoods of Bourgogne & Hay Moulay Rachid, with 26 station stops in between, serving approximately 2 million people. La Vie Eco (June 17, 2013) –In light of the early success of the tramways in both Rabat and Casablanca, on June 6th, Casablanca’s city council decided on a route for the upcoming sky train (elevated rail), and set the date of January of 2014 to begin construction. The project, which will cost approximately $955 million, will be undertaken by Casa Transports, which already handled the city’s Tramway project. To deal with downtown congestion, rising traffic pollution, and the demand for more public transportation, several alternative methods of transportation have been suggested for Casablanca in the past few years, including an underground subway system, buses with dedicated lanes, or another Tramway system, but the sky train has been deemed to be the best choice. It will be able to transport up to 400,000 travelers per day, 150,000 more than the Tramway, and will cost significantly less than a subway system. The 9.3 miles railway will link the neighborhoods of Bourgogne and Hay Moulay Rachid, with 26 station stops planned in between, and will serve an approximate total of 2 million people. Considering the relative novelty of the technology involved in this project, the city of Casablanca has been consulting with different experts from various countries, such as Japan, France and Turkey, in order to attract the top specialists in the field, but no choice of partner has been made yet. In the meantime, the city is still struggling with tramway accidents, which amount to an average of 15 per month. As a result, Casa Transports is planning an important media campaign to raise public awareness regarding this issue, and encourage people to respect the Tramway’s signaling system.